Learning from the women of the Bible. 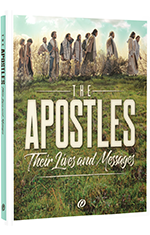 One of our most popular studies from the past, Frank Hamrick’s The Apostles has been updated and expanded for a new generation of believers. In this 15-lesson study, students will learn about the ministries of the Twelve Apostles, plus Paul. Christ transformed these diverse servants into powerful messengers of His gospel. By their example, we see that God will work through anyone who responds to His call. The Student Manual includes . . . The Teacher's Manual includes. . .
You can download or stream overviews of the following lessons for free on Vimeo. Play these videos in-class to quickly review the previous lesson, or share them with your students via social media to preview the study's big ideas.